Slightly more expensive than the 4.0e, the 5.4e is still considered to be a budget machine that comes with a large 6.5" backlit screen. It has most of the features from the 4.0e along with a lifetime warranty on the brakes and frame. The Xterra FS5.4e is the big brother of the FS4.0e, and whether you are looking for hitting every muscle group in the body or just getting a moderate exercise, the FS5.4e offers a promising set of features without crossing the $800 mark. A multitude of workout programs, coupled with the electric resistance levels, ensures that your workouts are challenging and interesting. It has a strong weight capacity. Better console compared to previous counterparts. MP3 compatibility with integrated audio jack and speakers. Durable yet quiet in operation. Pulse grip heart rate monitoring. Warranty of lifetime on frame and brake. The model has limited programs to choose from, offering only one more when compared to its predecessor. Warranty on labor for the parts is only 1 year. Oversized cushion pedals with 2 degrees inward tilt. Display showing RPM, Calories, Time, Distance, Pulse. Incline and resistance levels: 20. Programs: 7 pre-programmed and 2 customized. Biomechanically correct Q-factor for feet placement. Audio jack and speakers support. Warranty: Frame and brake have lifetime warranty, with improved parts warranty of 3 years. While for labor, it is 1 year. 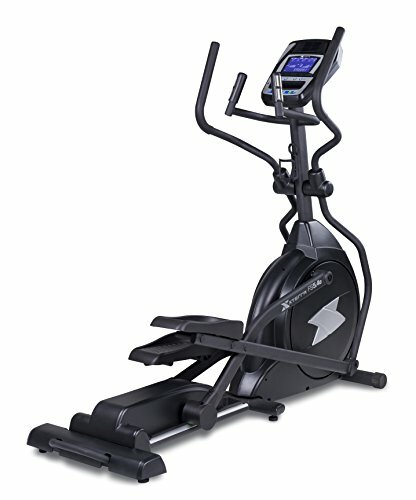 The elliptical can be used to achieve a full blown torching of muscles, stimulating both the upper and lower body parts. It does so by its incline and resistance setting, which can be taken on as a challenge on all of its 20 levels. The pre-set workouts are effective, and even targets specific body parts such as the ‘glute blast’ program, targeting lower body and buttocks muscles. The oversized pedal provides optimal body alignment, and the flywheel makes operation smooth, giving off to a killer workout. The Xterra models are known for its heavy duty steel exterior and parts. This elliptical uses sealed commercial bearings and premium bushings in pivot points, assuring a smooth workout on the machine. The oversized pedals are also proven to be great for foot placement, with its biomechanically correct Q factor. On top of that, Xterra offers a lifetime warranty on the frame and brake, and 3 years on improved parts. As for assembly, the manual directory explains the process elaborately. Instructions are fairly easy and simple, like most of the other models from Xterra Fitness. Time needed to set up could range from 90-120 minutes. When compared to the older FS4.0e model, the FS5.4e has the main addition in the form of a powered incline. The big brother has an improved display console and has an additional program option. The 5.4e is one of the better units in the price range, but even then, with the 5.6e model priced at just $50 higher, we’d highly recommend you check that out before you commit to this one.